Featuring versatile five-band and two-band processing for both analogue FM transmission and digital media, the 8600 provides the industry's most consistent sound, track-to-track and source-to-source. This consistency allows you to create a sonic signature for your station with the assurance that your signature will stay locked in, uniquely branding your sound. Orban’s MX limiter technology lowers distortion, improves transient punch, and minimizes preemphasis-induced high frequency loss. Exclusive “Multipath Mitigator” phase corrector minimizes stereo subchannel energy without compromising stereo separation. HD/digital radio/streaming processing is included at no extra cost. Provides a built-in RDS generator with dynamic PS. A dedicated low-delay headphone monitor chain lets you dial in controlled amounts of “FM limiter sound” to match talent preferences. Versatile remote control by responsive PC Remote application, Telnet-style ASCII terminal commands, and SNMP. Supports Ethernet and serial connections. 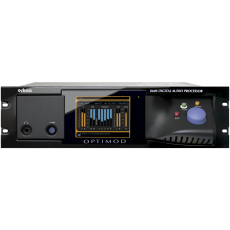 Delivers the inimitable “Optimod Sound,” proven to attract and hold audiences worldwide. The 8600 provides stereo enhancement, equalization, AGC, multiband compression, low-IM peak limiting, stereo encoding, and composite limiting — everything that even the most competitive major market station needs to stand out on the dial. More than 20 excellent sounding, format specific factory presets get you started. You'll find all of your favorite 8500 presets, plus "MX" presets designed by Bob Orban and Greg Ogonowski to exploit the exciting possibilities inherent in the 8600's new MX peak limiter technology. Although the factory presets are fully competent "out of the box, you can customize them with easy one-knob LESS-MORE control in Basic Control, with 50 parameters in Intermediate Control and more than 120 in Advanced Control, whose versatility will satisfy even the most finicky on-air sound designer. The newly added "Multipath Mitigator" phase skew corrector maximizes the quality of a mono mixdown or blend that might occur in a receiver while minimizing the energy in the stereo subchannel, which is the part of the stereo baseband most vulnerable to multipath. Dramatically improved peak limiter technology decreases distortion while increasing transient punch and high frequency power handling capacity. Compared to the FM-channel peak limiter in OPTIMOD-FM/HD 8500, the new peak limiter typically provides 2.5 to 3 dB more power at high frequencies, which minimizes audible HF loss caused by pre-emphasis limiting. Drums and percussion cut through the mix. Highs are airy. "Problem material" that used to cause audible distortion is handled cleanly. While this design offers about the same loudness as 8500 processing, its main goal is to make FM analogue broadcasts more competitive with the cleanliness, punch, and open high frequencies of the digital media against which FM analogue transmissions now battle. The FM loudness wars represent 20th-century thinking; the new competition is digital media. Thanks to its fresh, crisp sound, the 8600 helps level the playing field between analogue FM and its ever more aggressive digital-only competitors. The 8600 has an internal, DSP-based stereo encoder (with a patented "half-cosine interpolation" composite limiter operating at 512 kHz sample rate) to generate the pilot tone stereo baseband signal and control its peak level. The composite limiter is a unique, "you can only do this in DSP" process that beats composite clippers by preserving stereo imaging while fully protecting the stereo pilot tone, RDS/RBDS, and subcarriers. Additionally, the 8600 offers a newly improved, smooth-sounding BS.412 multiplex power controller.The stereo encoder's stereo subchannel modulator can operate in normal double sideband mode and in an experimental compatible single sideband mode that is offered to enable users to compare and assess the two modes. The 8600’s x HD ("Digital Radio") output, with 20 kHz audio bandwidth, is designed to feed streaming, netcasting, and digital satellite or cable radio channels, which can be DRM, DAB + or the iBiquity® HD Radio system. The equalizer and five-band compressor/limiter in the HD processing chain have their own sets of user-adjustable audio controls that are independent of the controls in the FM analogue transmission chain's equalizer and five-band compressor/limiter. The bottom line? Processing that optimizes the sound of your FM channel while punching remarkably crisp, clean, CD-like audio through to your digital channel audience. The 8600's built-in delay (up to 12 seconds) improves reliability in HD Radio facilities, by freeing you from the need to use the delay line built into the Digital Radio exciter. This allows you to use the 8600FM's built-in stereo encoder and composite limiter to drive the analogue FM transmitter, ensuring no-compromise analogue-channel loudness. Newly improved, the delay system now includes an “adjustment delay” in the digital radio path, allowing adjustment up to ±1.3 seconds without touching the analogue-path audio. to true peak control, sample rate conversion, unless it removes high frequency program energy or introduces group delay distortion, cannot cause sample peaks to increase more than 0.5 dB. For our European customers, a second generation ITU BS 412 multiplex power controller yields the best possible coverage while flawlessly complying with the standard. You can adjust it to maximize loudness within the constraints of the BS 412 standard or to produce less gain change at the expense of slightly lower loudness. New for the 8600 is the ability to apply MPX power gain reduction after the clippers so that the texture of the processing can include more "clipper sound" when desired. Regardless of how you adjust the multiplex power controller, you can be sure that you will always meet the BS 412 requirements flawlessly. A loop-through connection is provided to enable a ratings encoder (such as Arbitron®) to be inserted between the output of the AGC before the analogue-FM and HD processing paths split, allowing a single ratings encoder to be used for both the analogue FM and HD channels or between your Optimod’s left/right audio processing and stereo encoder, maintaining consistently high audio drive levels into the ratings encoder while allowing your Optimod’s composite limiter to be used. Analogue Fallback to Digital control that allows Silence Sense to switch the active input from Analogue to Digital if silence is detected in the analogue input signal but not on the digital input signal. This function works vice versa as well on both analogue and digital AES input. The silence sense parameters apply to both simultaneously and both detectors are available to drive the 8600's tally outputs and sending SNMP Traps/Alerts. The 8600 includes a full-featured RBS/RBDS generator at no additional charge. The generator supports dynamic PS. It can be controlled via 8600 presets and an ASCII terminal server that can be connected to automation to support displaying title and artist. The easy-to-use joystick, knob and button navigation system and a bright, active-matrix color LCD that make it easy to program the 8600 from its front panel. Ethernet and RS232 serial connectivity are standard, as is a responsive easy to use PC remote control application (for Windows XP and higher) that can control multiple 8600s on a TCP/IP network. SNMP support allows you to monitor your Optimod’s status and to send Alarm notifications via your Optimod’s Ethernet connection to your netowrk. Additionally, programmable contact-closure (GPI) control plus ACSII terminal control via the 8600's RS232 serial and Ethernet ports and give you total freedom to interface the 8600 with your facility's remote control infrastructure, whatever it might be.